Though he has been based in the music capital of Austin, Texas for the last several years, David Ramirez has spent a lot of his time touring the country with little more than a car and his guitar. 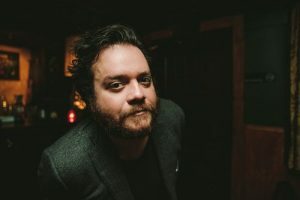 The last few times he has come through Birmingham, he has stuck to that guitar, vocal mic, and barstool combination at venues like WorkPlay and Bottletree, and he frequently plays shows with Birmingham’s own Matthew Mayfield. However, this time around, Ramirez will be bringing a full band along for the ride. His newest offering, We’re Not Going Anywhere, blends Ramirez’s forlorn croon and powerful choruses with pulsing synths and political imagery. Produced by Sam Kassirer, keyboardist for Josh Ritter, at the Great North Sound Society, an eighteenth-century farmhouse in rural Maine, We’re Not Going Anywhere stands in defiance of expectations while still delivering a record current and future fans will no doubt enjoy. We spoke with David Ramirez ahead of his Saturn performance on Saturday, December 16. He answered questions about the new album and musical direction, Spotify streaming and playlists, and the art created during and after political elections. Magic City Bands: You recorded an EP several years ago called Birmingham. What’s the story behind that? David Ramirez: In 2008, I left Nashville and was just kind of traveling and living in my car. One of the first stops I made was a house show in Birmingham. I only made $30 so I didn’t really have enough to get out of there. One of the guys at the house show, Chris Weninegar, offered to let me crash on his couch for a week and said he’d let me record an EP for free. He brought in a few people from the city to play on it [Alex Mitchell and Rebekah Fox]. I felt it was appropriate to make the title Birmingham after all the love I had been shown. MCB: You’ve mentioned that the two women on the album cover of We’re Not Going Anywhere are breast cancer survivors. Can you give a little more background on their story and how you came to know them? DR: I knew what I was going to name the record after I wrote the final track, “I’m Not Going Anywhere.” I just wanted to embody that youthful rebellion. My friend, Phillip, who took the photograph, that’s his grandmother and his aunt on the cover. I was in Des Moines hanging out with him and his family. I got to meet them and they were just perfect. They were funny and youthful and free-spirited, so I asked them to be on the cover. MCB: Musically, the album took a bit of a left turn from your usual vibe. What influenced that new direction and did the recording location, which was an older house, affect the music at all? DR: I was getting bored making the same record over and over, so I knew I wanted this one to be different. It could have gone one of two ways. It was either going to be a Neil Young/Crazy Horse thing or what it is now, an 80s synth pop. The songs that I was writing lent themselves more to the latter. I’m not sure how much the house played into [recording the album]. It was just neat to be isolated in the middle of nowhere and that helped a whole bunch. As far as the sound though, I don’t think it played that much of a part. I think a lot of the brilliance of the record came from the mind of Sam Kassirer (producer for albums by Josh Ritter, Lake Street Dive and more). That being his house, maybe that helped a lot for him. MCB: What were some of the songs that kickstarted this new album? DR: I think the first handful I wrote were “People Call Who They Want to Talk To”, “Stone Age”, “Elisa Jane” and “Twins.” Those were the first few that came out. MCB: You also did a series of videos for the songs, especially with the Twin Towers reference in “Twins”. DR: I just wanted to make something as unsettling as possible. We chose a lot of footage of early American dream, mid-century black and white footage. I think paired with the song, it makes it pretty uncomfortable to watch. That was the goal the whole time. “Time” was a video I made about our time in the studio. I shot and edited that one myself. I just wanted to make a snapshot of our time out there basically just for me, so I can always look back on it. “Watching From A Distance” was a stripped-down version with me and a piano. I love that one and felt it turned out well. MCB: This record does have a good bit of political undertones. Do you think even if Donald Trump had not won, we would still have a lot of political art coming out this year? DR: I think so. It was unlike any election I have seen in my lifetime. It was split pretty hard. I don’t know if we’d see a lot of the social things we see happening right now such as outward racism. I think a lot of those things would still be pushed under the rug, but I think it’d still be pretty interesting. Of course, no one can say for sure. We don’t know what that world looks like, only the one we’re in. MCB: How do you think releasing several singles via streaming services leading up to the album release helped build buzz this time around? DR: When you’re on my level, it’s not like you can just call Rolling Stone and they blast out a cover piece and the whole world knows that my record is coming out. I appreciate resources like Spotify and different blogs and publications for featuring singles and spreading the word and letting people know that might normally have no idea who I am. There’s just so much music out and entertainment going on with television. It’s hard to be heard. It helps a lot to release the singles every few weeks. MCB: And you’ve also been featured on a few different Spotify playlists recently. DR: That’s some of the beauty of Spotify, that discovery aspect. Someone in another country, another state, another city can just get on a random playlist of music they do enjoy and stumble upon your tune. It doesn’t always work out perfectly, but it does help. MCB: What are some of the albums, films or books that you’ve discovered this year that you think our readers should check out? They don’t necessarily have to have been released this year. DR: Some of my favorites right now are the latest Killers record [Wonderful Wonderful], IT and this book of Raymond Carver short stories called The Things We Talk About When We Talk About Love. David Ramirez plays Saturn this Saturday, December 16th with Molly Parden opening. Saturn is located at 200 41st St S, Birmingham, AL 35222. For more information and to purchase tickets for this 18-and-up show, click here.